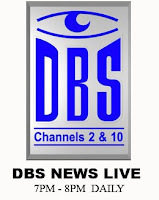 One of St.Lucia's broadcasting televison stations, Daher Broadcasting Service has chosen to broadcast DBS News Live nightly from 7pm to 8pm over the internet. It is reassuring to know that no matter how far away from St.Lucia I might be, I can still keep abreast of the affairs and developments on the island. DBS is revolutionizing the manner in which St.Lucians abroad (even foreigners) obtain news with regards to the island. Angela Simmons: Rockin' this Vest! Mala Bryan ... kept her word! YAY! Karrine TV ... a must see! For baby ... now on the go! How Not to Work Out!